One of the many sights in the Cathedral of Vienna is the cathedral treasure. The small museum is in the two upper floors above the entrance of the St. Stephen’s Cathedral (Stephanskirche), the large and famous church in the centre of Vienna. After checking the tickets for the Cathedral Museum, take the elevator up two floors. Then you are directly in the first room of the museum. The way goes down and up narrow spiral staircases. The exit of the cathedral museum is down in the church. What can be seen in the cathedral treasure of St. Stephen’s Cathedral? In the small museum you can not only look at the cathedral treasure, but you also have a wonderful view of the interior of the beautiful church from above. Among the exhibits in the varied exhibitions are paintings, statues, works of art made of gold and silver, chalices, a famous altar and much more. We particularly liked the great works of art made of gold, silver and precious stones such as the so-called cathedral monstrance from 1482 in the late Gothic style. The most famous object in the cathedral treasure in Vienna is probably the Ober-Sankt-Veiter altar, which was designed by Albrecht Dürer at the beginning of the 16th century. Another cathedral museum is outside the church on the cathedral square. Adults pay 6 Euro for the cathedral treasure, children up to 14 years get a ticket for 2 Euro. Important: You pay extra for many things in St. Stephen’s Cathedral (like Steffl Towe r ascent on foot, small tower with elevator, the interesting catacombs, the interior of the church, etc.). 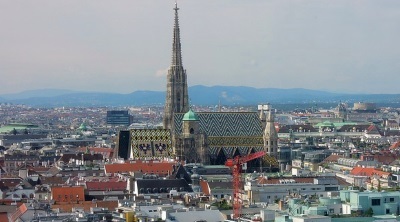 If you want to have a look at a lot of things, you can save a combi-ticket for all sights in the cathedral of Vienna. You can buy this ticket on the Internet on this webpage. The cathedral treasure is daily from 9 to 17 o’clock, on Sunday because of the church service in the morning only starting from 13 o’clock. This also applies to most public holidays in Austria. Link tip: Cathedral Florence: A lot is similar: Here there is also a cathedral museum, a cathedral treasure, ascent of the church tower, underground corridors, etc.